Weddings are a beautiful and personal day, each different from the next, each with their own story to tell. It’s getting the chance to tell that story through the art of photography that excites me. My manner is polite and non-intrusive, my photography is elegant and cinematic. I capture real moments with genuine emotion and make beautiful images for you to cherish forever. I keep things very simple, I want to tell your story in full so I photograph your entire day, from start to finish with no time limits and no restrictions. I include a full set of the photographs with every wedding. If you'd like to meet me to talk more about what I do then please get in touch. I'm contactable via the contact tab above, my email address info@thestoryhouse.co.uk or if you'd rather you can give me a call on 07966 706 133. The Morning starts when your day starts, usually with your bridal hair and make up. Capturing the excitement and the nerves, your wedding dress, the flowers, your friends and all those little details you’ve been putting together over the last year. The Ceremony starts as your guests arrive at the church and with your groom as he waits nervously for your arrival. Continuing throughout the whole service capturing all those loving memories, exchanging of the rings, the first kiss and those exciting first moments as husband and wife. Once the service has concluded, we then go on to make a lovely set of family formal photographs to show off all those glamorous outfits. Then it’s your turn, a beautiful set of wedding portraits of the two of you, the real show stoppers. The Evening starts as you rejoin your friends and family, the food and speeches are about to begin. I’ll be with you for all the special moments, cutting the cake, your first dance and for any other traditions your families may have. I’ll also be there to capture all the little moments, the laughs, the cheers and the bits you might miss. As the party gets going after the first dance, I’ll be right there with you until the end. What else is include with every wedding? Visits to you wedding venues prior to the wedding day with you and your partner. My photography throughout the elements you have selected from the list above. 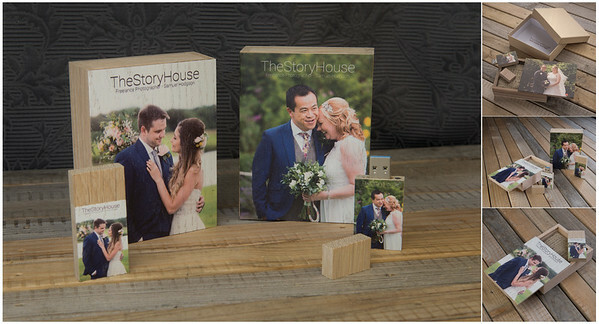 A beautiful wooden USB memory stick fully loaded with approximately 600 carefully selected photographs in full resolution and ready to print. A secure password protected online gallery so you can easily share your wedding photographs with friends & family. I have a pre-wedding portrait session available priced at £200. This session also includes the ready to print digital photo files as well as the password protected online gallery. Prints – If you would like to buy prints from me, there is a whole range available straight from your web gallery starting from £3 each. Wedding albums – Designed by me, printed and assemble by ‘Kiss wedding books’. These high-end books start from £200 for Linen, £350 for Leather or £400 for the Tuscan.